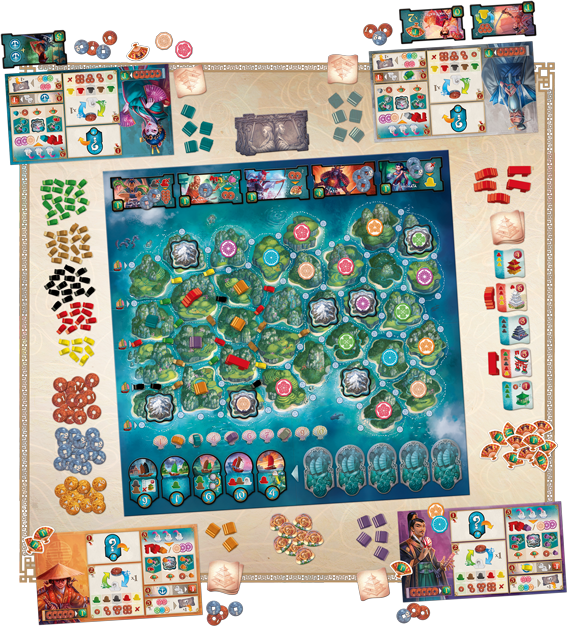 When you first see a game of Yamataï in progress it can be a little overwhelming, lots of different pieces in different colours all over the board, and a plethora of tiles and tokens doesn’t make it look simpler. While the game is in no way a light game, player turns are actually quite simple. First thing you do each turn is pick a Fleet tile. You can pick from among the 5 available on display and you do this in turn order. These Fleet tiles will give you some of the different coloured ships in the game. Some of the fleet titles will give you better and/or more ships than others, but the fleet tiles also includes a turn order for the next turn. So if you pick a very powerful fleet title this turn you’ll be the last to pick fleet titles next turn and the last to take your actions. Also there are only 5 out of 10 fleet tiles available each round, at the end of the round the used ones will get shuffled and put at the back of the fleet title queue, revealing new ones for the next round. After picking a fleet tile and getting your ships you now have the option to sell or buy a single ship. Some ships are more rare and expensive than others. Now we get to the magical part of the game. You’ll now have a few different coloured ships, that you can place on the main board. There are placement rules, but in general you want to make sure there are the right coloured ships around a specific island so that you can build a building or palace there. Each turn a number of buildings and palaces can be built, but they require a different combination of ships around the island. If you have placed your ships correctly you can build one of the buildings / palaces on display. This is the main way you’ll score points in the game. You’ll score extra points for having chains of connected buildings, and for building next to a palace. But trust me people will do what they can to prevent that from happening a lot. Instead of building you also have the option to pick up culture tokens on the islands (in fact you can only build on an island that does not have a culture token on it). These tokens can then be used to buy a Specialist title. These provide you with ongoing special effects and/or end game scoring. The game can end in various ways, but normally it will be due to a player having built their last building or if a colour of ship runs out. 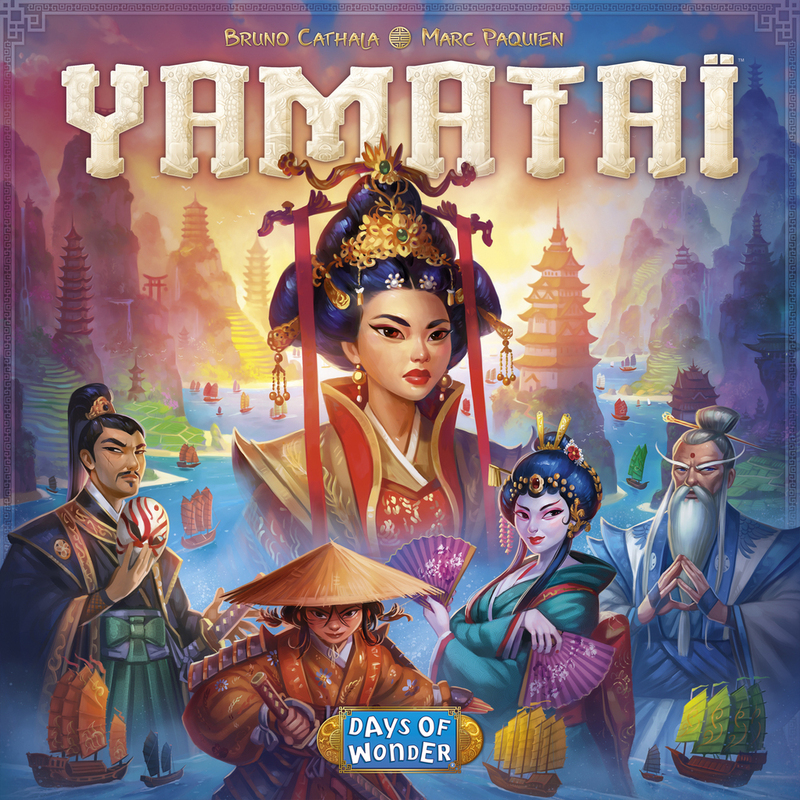 Had you asked me what I thought of Yamataï halfway through my first game of it, I would have said it was an alright game, but nothing special. But if you ask me now, I think it’s an amazing game. Yamataï takes a little time to wrap your head around. Though the rules are simple, the interaction with the shared board, the Fleet tiles and the Specialist tiles, all can make the game seem a little daunting at first. But after a play or 2 you’ll quickly realise that the game is not actually that complex to play (while it remains very hard to master). It’s the kind of game that grows on you and you get a deeper understanding of it the more you play. The first game you’ll be very focused on what you can do and how you can build that building and what ships you need for it. But you’ll soon realise that everything you do affects the main board. Every action you take can potentially help the other players (sometimes a lot). So once you get a hang of the flow of the game, your horizon starts to broaden. You now have to pay attention to what affects your actions will have on the other players, and if your actions are helping them more than you. This is where turn order and keeping track of what ships people have stored becomes very interesting. I simply love games like this, that become deeper and deeper the more you play them. Games that have a well-defined and simple rule set, but offers so much more that just a simple game, are hard to come by, but Yamataï does it so very well. My hats off (and I’m not just saying that, I actually wear a hat) to Bruno Cathala and Marc Paquien for making this gem of a game. I also have to mention the amazing art by Jérémie Fleury, it really is some of the best art in any game. 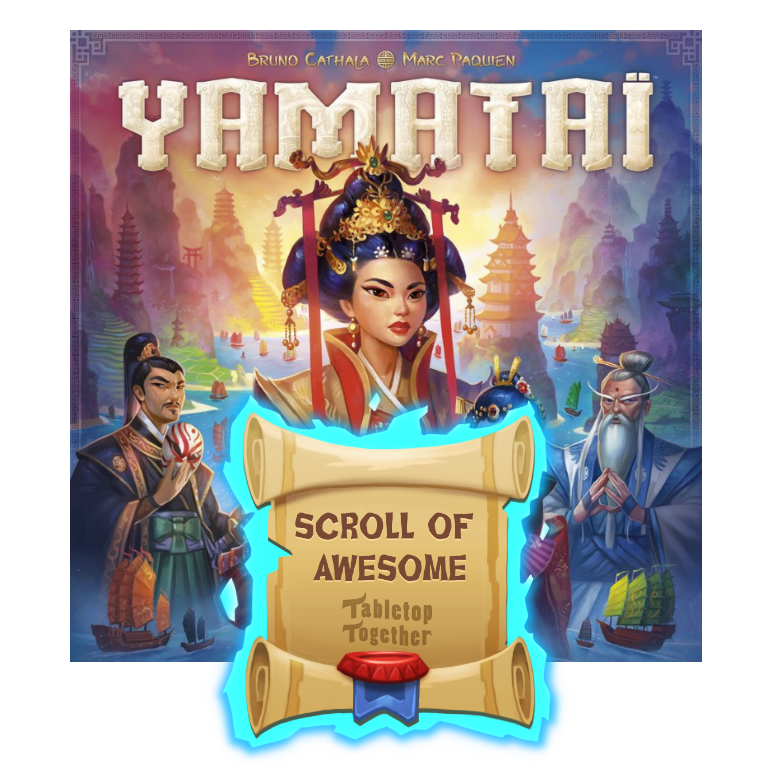 Yamataï simply has to receive the highest praise possible, the coveted Scroll of Awesome. 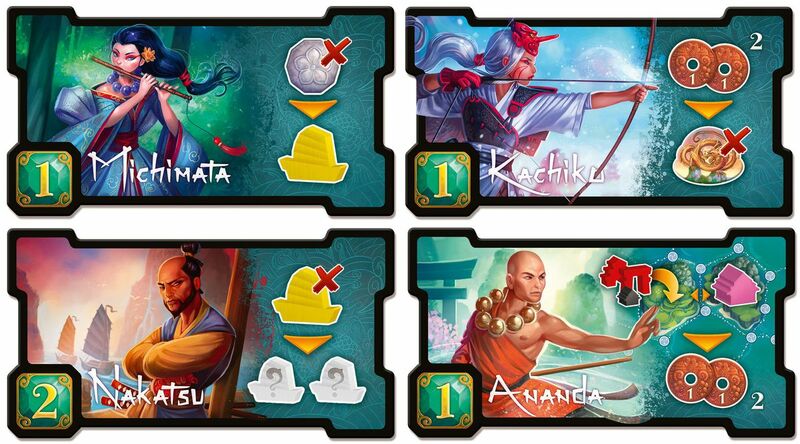 While Yamataï does not have complex rules, the facts that it plays and feels different to other games, means it takes some time to wrap your head around. The special actions on the fleet tiles along with the specialists themselves take some time to thoroughly take advantage of. This is definitely going to be a Christmas request this year. It’s my most wanted game at the moment. Sounds right up our alley. Thanks for the review! I agree in everything you say. This game don’t recieve enogh love for such a great example of design and deepness. I’m new in the website and not english speaker. Sorry for my grammar skills! Tank you for the review.